This project profile details the design and installation of a geomembrane system to line an offshore containment bund for the government of Singapore. The Pulau Semakau project involved the construction of a 7-1/2 Km rock bund and cost $1.6 billion (U.S. dollars). Geomembrane represented the most reliable and easily constructed barrier for the perimeter bund. About one half of the 600,000 square meters of geomembrane were installed under water prior to dewatering of the containment area. The selection of the geomembrane and subsequent packaging, transportation, and installation are detailed within this paper. The unique constructability issues centered around the geomembrane properties including density, flexibility, and pre-fabrication, particularly compared to conventional clay containment systems. Data is also presented from other independent studies comparing the relative containment features of alternative lining systems. The tiny tropical nation of Singapore covers only 90 hectares (225 square miles) and is located at the southern end of the Malay Peninsula (see Figure 1). This flourishing nation of three million inhabitants is the world's busiest port and a major center of trade, banking, tourism, and communications. All of this prosperity means increasing concerns for waste disposal. In the early 1990's, Singapore began planning for replacement of the long used state owned landfill which was to be at capacity by 1998. The unique solution, proposed by the Ministry of Environment of Singapore, called for an offshore waste disposal facility to contain inert incinerated residue for the next 30 years. Relying on land reclamation techniques long employed in Northern Europe, the facility called for the building of a 7-1/2 km (4.2 mile) earth bund in water depths ranging from 10 m (33') to 20 m (66'), resulting in a 30 ha (75 acre) offshore waste pond. The bund served as a connecting wall between two offshore islands. Therefore, installation techniques were required for both dry and wet scenarios. In conjunction with various other hydraulic considerations, the seawater was to be displaced as the solid waste filling progressed. The offshore bund was constructed by transporting and dumping 4.5 million metric tons (5 million tons) of rock and 36 million metric tons (40 million tons) of sand. The construction materials were transported from Indonesia. 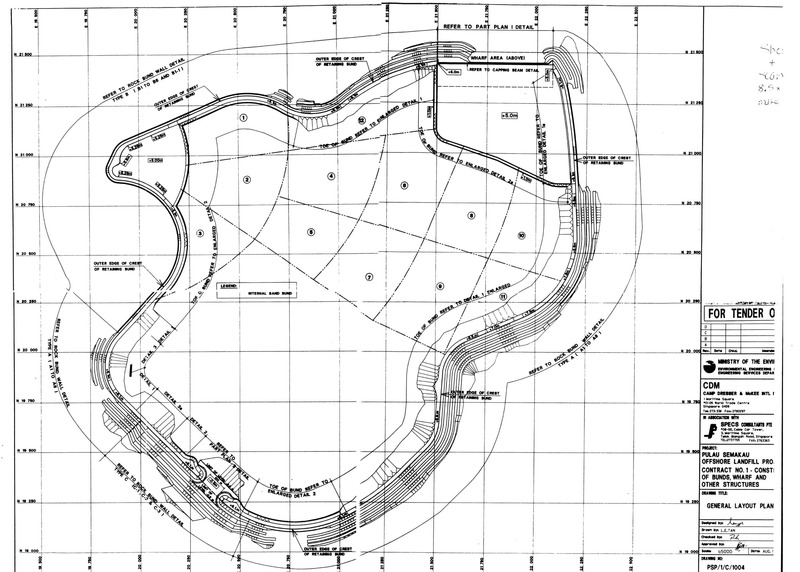 Figure 2 is the General Layout Plan for the Bund Project. The earthen wall connected several islands offshore from Singapore. Figure 3 illustrates the typical bund cross section which varied depending on the ocean depth. The offshore bund was created using stone with geofabrics for separation and filtration and sand was hydraulically installed in the body of the bund. A geomembrane was used on the interior surface of the dike, which was keyed into the seabed. Offshore investigations had shown that the seabed soils consisted of silt and clay of depths up to 10m (33')' overlaying rock with permeabilities less than 10-8 cm/sec. The project designers considered vertical leachate migration not to be a problem. The facility was designed to be operated with no net head difference from internal to external water levels. Therefore, hydraulic head forces on the containment layer are minimized. Rather, the interior of the bund was lined with a geomembrane which was then covered with a clay layer under the water level and rock at shore level. Outer slopes utilized geofabrics on a 1:3 slope (for shore protection) and inner slopes employed a flatter slope at 1:5. The construction of the bund is shown in Figure 4. Several lining materials were considered for the containment portion of the project including clay layers, Geosynthetic Clay Liners (GCL's), and various geomembranes. Selection criteria included Leakage Rate (theoretical) and constructability. Because of the difficult construction techniques involved, cost considerations were a minor selection criteria. 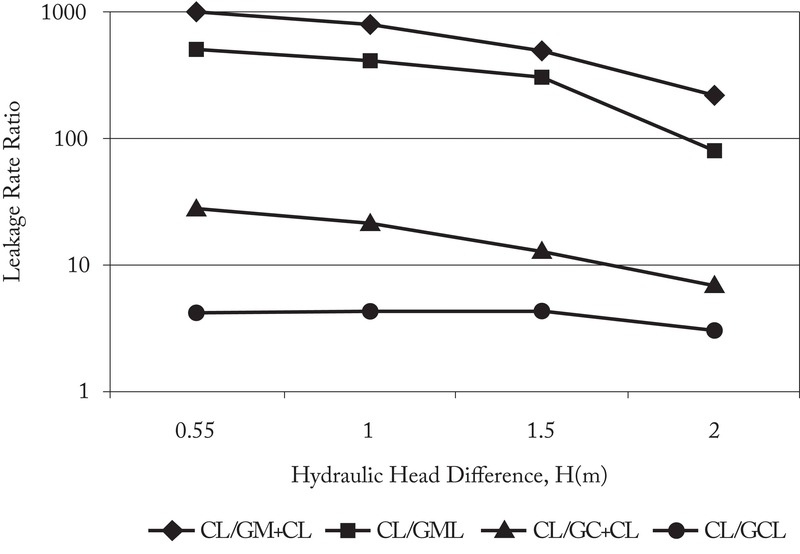 Hydraulic modeling by Tan, et al, showed that significant leakage rate potential reductions could be achieved using a geomembrane as opposed to a single clay layer or a clay layer and a GCL. Figure 5 illustrates the conclusions drawn as a result of this modeling effort. Leakage for the liner varies with the selected liner alternative. A GCL was shown to be 5-30 times better than the clay alone, a geomembrane liner 50-100 times better and a geomembrane with clay was 200-1000 times better. The ranges are dependent on head conditions. With the geomembrane/clay layer as the selected alternative, a material selection then concentrated on constructability. Field seaming and the use of large mechanical equipment for panel placement had to be minimized due to site constraints. There were two site installation scenarios, one was a "dry" installation in the areas of existing land, and the other involved a "wet installation", where the geomembrane would be installed from a barge into the ocean leading to the land. In the evaluation of constructability, the weights of the panels, along with associated friction angles for the considered materials are contained in Table 1. In the first (dry) construction scenario, published friction angles were used to determine a theoretical safety factor when dragging the geomembrane into place. Table 2 summarizes the Force Tug Point, Allowable Force and Factor of Safety for each of the considered materials. All geomembranes considered in this "dry"scenario analysis have safety factors greater than unity. However, the reinforced EIA Coated Fabric was 3 times as reliable as the laminated materials and 6 times as reliable as the HDPE film in this analysis. These conditions, of course, represent worst case conditions, but are representative of the possible forces to be encountered in this field operation. Folded panels ready for installation along the bund are shown in Figure 6. Note the materials with specific gravities (SG) less than 1 were assumed to require added ballast in order to provide a SG equal to the EIA-RCF, 1.25. Table 3 summarizes the forces and theoretical safety factors for each material. While all exceed 1.0, the EIA-RCF geomembrane greatly exceeds the other materials. A portion of the geomembrane would be installed underwater and therefore a Specific Gravity >1 was needed. Ultimately, clay and rock would overlay the geomembrane which could result in some damage. A material was needed which would be most resistant to puncture. Large panels were needed which could be custom prepared based on both width and length. Field preparation of the material for fitting was to be minimized or eliminated. Overlapping rather than field seaming was to be used and then covered with the clay layer. Width was to be maximized in order to minimize amount of overlapping. Panel seams were to have maximum strength to withstand dragging and placement in the tropical environment, often under sustained loading. Abrasion strength was to be sufficient for installation. The project designers created a specification that demanded the properties, listed in Table 4. Ultimately, the supplied material was a reinforced Ethylene Interpolymer Alloy (EIA), manufactured as a Reinforced Coated Fabric. The selected material allowed the contractor to install the geomembrane and clay layer in sections as bund construction proceeded. 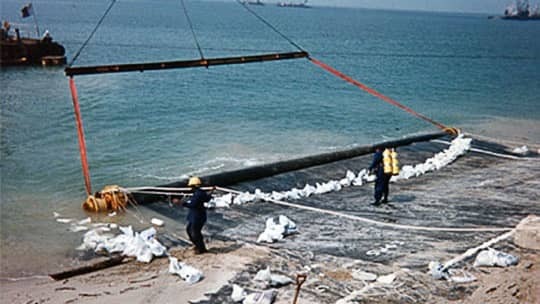 The geomembrane was prefabricated into large panels of widths up to 18.2 m (60') and lengths as determined by ocean depth and subsequent bund design. Fabricated panels were accordion-folded for shipment to Singapore. This folding technique made installation of the Geomembrane very efficient with an unfolding sequence that minimized material handling. All sheet manufacturing and fabrication activities were subject to QA/QC procedures and field activities were conducted according to a CQA plan, all approved and monitored by the Singapore Ministry of the Environment. Figures 8, 9 and 10 illustrate the Geomembrane unfolding and installation. Underwater divers were used to key the leading edge of the geomembrane to the ocean floor, shown in Figure 9. Figure 10 illustrates a completed bund area with the geomembrane in place. Sand and riprap were dumped over the geomembrane once it was installed. Installation of a typical panel required 1 day. This project illustrates the versatile constructability of geomembranes as opposed to traditional clay-type materials. Without the use of a geomembrane, it is estimated that construction of the entire disposal facility would have been impractical, requiring different design techniques and different environmental constraints. The Pulau Semakau accepted its first shipment of waste in March 1999. The geomembrane used in the bund construction was XR-5®, manufactured by Seaman Corporation, Wooster, Ohio, USA. The Panel fabricator was Lange Containment Systems, Denver, Colorado, USA. Project designers were Camp, Dresser and McKee Intl and Specs Consultants Pte. Ltd., both of Singapore. Tan, S.A., et al, "Leakage Study Across an Offshore Waste Containment Bund", Proceedings, 1998 Sixth International Conference on Geosynthetics, Atlanta, Georgia, 1998. Reprinted from "Proceedings, Geosynthetics 2001", Portland, Oregon, USA, February 2001.